I've always really enjoyed the harmony on this song, however, it seems to be a bit controversial - Is it John or George singing the lower harmony during the verses? I have to say it's George singing on the lower end of his register. It does sound like it could be John, but George had the uncanny ability to sound like John at times (listen to how their voices blend on "She Said She Said "). - John clearly comes in on the "You can do something in between" line, while George continues to sing the low part. - The way the lower "car" and "star" are pronounced sounds more like George than John. - I can hear John's voice matching Paul's while George sings low. I'm about 90% sure that it's George, but I'd like to hear your opinions. The isolated vocal track to "Drive My Car " for those who want a quick listen. I had trouble recognizing who was who on the harmony originally, but I always thought it was John. John harmonizing on the verse. At the pre-chorus and chorus it's a 3 part harmony with Paul, John, and George. (like you said). The group then overdubbed piano, lead guitar, piano and cowbell parts, along with lead vocals by Lennon and McCartney, and backing vocals by Harrison. And also, if you listen closely to the isolated track I think you can hear what seems to be some George guitar work before Paul went over it with his own takes. Right at the end of the solo when you hear that last high note, it seems earlier than in the recording. In fact I listened to it on the released version and you can hear it as well. Also the licks at the end seem different Hmm, maybe? Wait a minute, had a brain lapse. They could have done them all at once and still had George on the low part. But its odd because in the scores it says its two parts, when you hear 3 people singing...double hmmmmm. Hope I helped somehow and didn't entirely confuse you or myself. Well, it's definitely John & Paul doing the verses. Not sure exactly who's singing what during the choruses. I think this song might be just John and Paul. Is it possible John sung the lower harmony, and then John added an overdub on the pre-chorus where it becomes 3 parts (the higher of his two parts)? Because "and maybe I'll love you" is double tracked, and the second one of that could be from the overdub. The only part I could see George singing on would be the "Beep beep" parts. Edit by Joe: The following part of the discussion was hived off a thread titled Ringo Starr and the development of the Air Fill, but it made more sense to have it here. It's a great intro but the timing of it is confusing for me and many others! The guitar seems to begin on an offbeat and the bass on the on-beat but then pauses for an extra beat, and the drums come in exactly on time. And then the lyrics start after a beat in the measure. 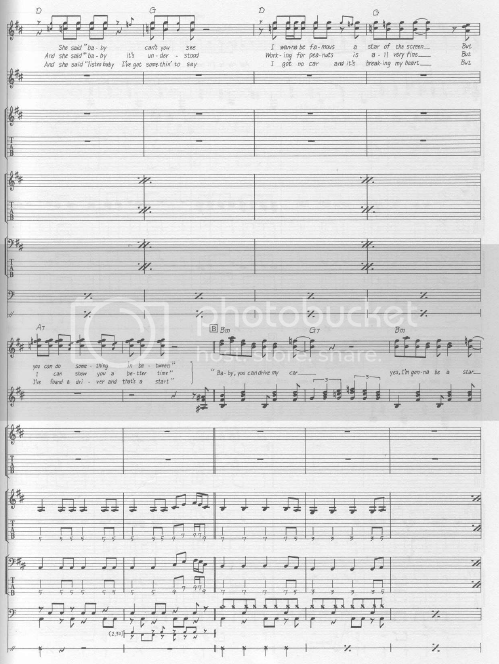 The sheet music starts with a bar of 4/4 then a bar of 9/8 where the drums start exactly 4 beats before the first chord of the first verse which starts 4/4 off again. Clear as mud, eh? Even knowing the timing, what throws you off is the style of the guitar riff combined with the bass holding the note for an extra beat. It's deliberate, and as far as I know, unique in a Beatles song. And we don't know who came up with it, or any other details about it. I'm a bit lost as I'm not a drummer - but I sure appreciate the analysis! The opening to "Drive My Car " always sounded a bit muddled to me - but in a great way. This probably belongs in the "song" section for Drive My Car , but here's my drum notation of the first 4 bars. As mentioned by @ewe2 , the song starts with a bar of 4/4 - count 1,2,3,4 - then a bar of 9/8 - at twice the speed as previously - count 1,2,3,4,5,6,7,8,9. Then swiftly settle back into 4/4 again. Any clearer? If not, the top notes are hi-hat/cymbals, below is the tom-tom, below that is snare, next below but not used is the floor-tom, then the bass drum. I suspect the "late" cowbell and tambourine (missing the first beat of the third bar) is either down to a late fade-up during mixing, or confusion as to when start playing?!!!!! PS You'll have to click on the image, I've no idea why it's displaying as tiny as it is. Well, then The Beatles were indeed masters in their craft, because what is confusing from an intellectual viewpoint sounds perfect when you hear it. Yes, I wonder whose idea it was. The four of them as a band? George Martin? I suspect the "late" cowbell and tambourine (missing the first beat of the third bar) is either down to a late fade-up during mixing, or confusion as to when start playing?!!!!! My best guess is that it was a lucky mistake and they ran with it. Probably a misstart on a take pasted on the rhythm track and stuck to the beginning of the song. That would explain why the drums come in correctly and possibly why there's a beat missing in the first bar, from the paste overwriting the first eighth beat (or a fade-up to obscure the join). The boys liked the idea and George made it happen. It sounds to me more like a bar of 4/4 followed by a bar of 5/4 (George's opening guitar note is on the off-beat just before the 4/4 bar), but Ringo speeds up a little and brings the song in a fraction early. I'd bet nobody in the studio was counting out eighth notes. For years, when listening to the record without the count-in, I'd always assumed that George's first note is on the first beat, which is why it sounds so discombobulating. Sheet music is often exact for pointless reasons and misses out essential nuances for equally pointless reasons, and the Beatles compete scores is not immune. It can be annoying. In terms of swing, 5/4 feels more right but in terms of accuracy they went with 9/8 just to make sense of it and base the timing on the drums. I'd bet nobody in the studio was counting out eighth notes. Purely instinctive-the guitar part was probably a spur of the moment necessity with no regard for timing issues. if the second bar is 5/4 it's difficult to time the drum fill. 9/8 gives you the urgency to time the fill perfectly. I've played the song live, and relied on instinct, made for a few anxious looks between band members! She's A Woman can be similarly troublesome. Should this fascinating discussion be in the Drive My Car thread? @Oudis @ewe2 @Oyster Black Pearl Thank this post if you think the above posts should be moved. I'd been thinking that too, so I jumped the gun and moved it. It took me hundreds (thousands?) of listenings before I realized that the notes George play duplicate the melody of the sung "...and baby I'll love you", with maybe an extra grace note or two thrown in. But this awareness only serves to disorient me further, if anything. @Oyster Black Pearl 's comparison with "She's A Woman " is a good one, and I'd also throw in "...Me And My Monkey" as another song with a misleadingly-syncopated intro. And what if we think of it as a 2/4 instead of a 4/4? And the riff starting in the upbeat of the first bar?